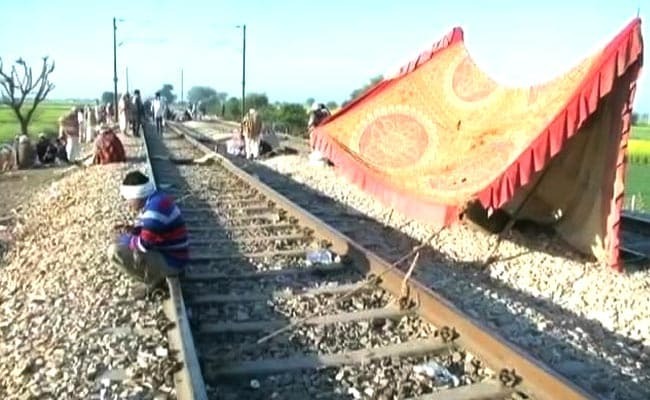 Members of the Gujjar community continued to block railway tracks on the second day of their agitation today to demand implementation of the 5 per cent reservation that was promised to them by the Rajasthan government. Agitating Gujjars sat on railway tracks at Malarna Doongar near Sawai Madhopur, leading to the cancellation of five trains and the re-routing of 15. Gujjar leader Kirori Singh Bainsla started a dharna yesterday along with his supporters on the railway tracks in Rajasthan’s Sawai Madhopur district, demanding reservation for five communities including Gujjars. The agitation comes nearly a month after 10 per cent quota for the economically weaker sections in the general category in jobs and education was cleared by parliament. “We have a good chief minister and a good prime minister. We want that they listen to the demands of Gujjar community. It isn’t an uphill task for them to provide reservation,” an agitating member of the Gujjar community told news agency ANI. “We want 5 per cent reservation. The government hasn’t responded to my request. So, I am going to start an agitation,” Mr Bainsla told news agency ANI. पाकिस्तान पहुंचे विश्व एकादश के खिलाड़ी, लाहौर में कड़ी सुरक्षा ! Kumar Vishwas:- A Unique Love Marriage!